This is a recipe that was crowd-sourced on the Saison, Biere de Garde and Farmhouse Appreciation Society on Facebook to be a kind of best-of-both-worlds interpretation of both classic and modern saison characteristics. It has been brewed by a number of breweries in the US as well as a good handful of homebrewers I would imagine too. The grist and hop schedule were defined but the choice of yeast was left up to the brewer in order to bring a personal touch from each participating brewer. I chose to use the Mad Fermentationist saison blend from Bootleg Biology, augmented with a bit of Funk Weapon III, as I had freshly saved this yeast from my last batch. The use of low-alpha hops as bittering, while counter-intuitive in modern brewing, has been something I’ve increasingly become a fan of lately for saison as it lends a herbal backbone to the beer that only large amounts of hop matter will provide. The inclusion of Motueka and a more characterful Hallertau varietal gives a more modern hop aroma and flavour, while the rye helps the yeast in giving a spicy edge. Above: My glamorous brew setup in the bathroom. 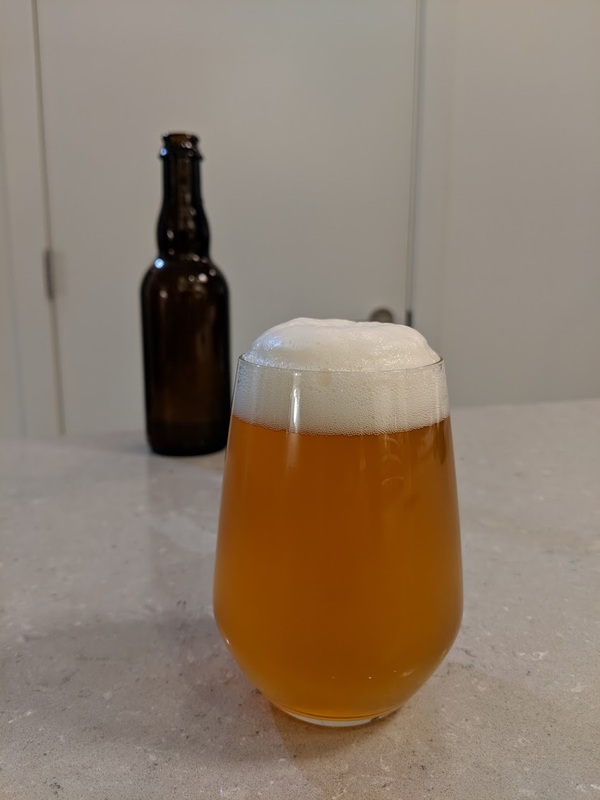 I followed a more involved mash schedule than usual in an effort to optimize the head retention of this beer – which could be in vain, since I pitched a blend with a decent amount of LAB in it. I mashed with 4.15 gallons in the Grainfather; sparged with 3.65 approximately. 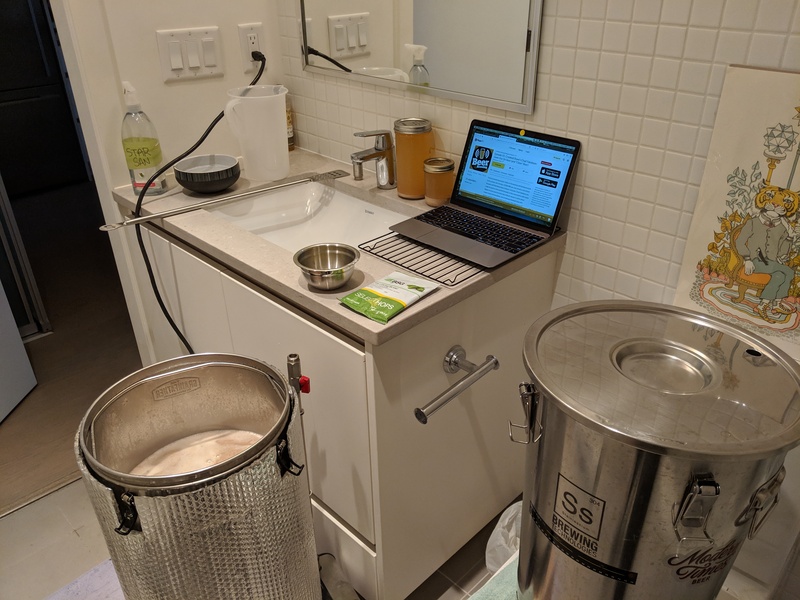 Mash was slower than usual, surely due to the rye malt – which, in addition to being huskless, was milled using my burr grinder on its most coarse setting as I didn’t have a mill to use on it. This produced a bit more “flour” than I would like to admit, but overall it didn’t seem too bad. The slow mash could be why my gravity was way high on this batch compared to my normal extract – pre-boil gravity was a startling 1.050, when I was going for the mid 1.030’s. I added one gallon of water early in the boil but even still, the OG of this beer is 1.048. I intend to dilute a bit further at bottling. After collecting about 5.4 gallons of 1.048 wort at 72F, I pitched roughly 200B cells of the yeast blend after about 15 seconds of pure O2. Left at ambient (around 68F), activity started around 18-20 hours in and was chugging along nicely at 24 hours. Bottled December 24, 2018 at a FG of 1.004, primed to 2.7 volumes to account for a little more attenuation in bottle. I would have liked to let it stay in the carboy longer, but due to pipeline constraints I’m letting the rest of the conditioning happen in bottle. Jan 24, 2019 – At one month in bottle, the carb is pretty good. Aroma is slightly cidery, but no apple on the taste – very herbal, comes across more malty and full bodied than Saison Doree did, which is surprising considering their similarities and matching water profiles. Heck, it’s also a good bit darker which I find surprising. Good touch of acidity but not too much. Still young so I’d say it’s promising.